In my previous post I mentioned that I would post the garlic chutney recipe that my mom used to make. I had messed up the last time and this time it came out quite well. There is no way it is going to come out the same as my mom’s! I made the recipe based on phone conversations. Chutney is from the sanskrit word meaning “for licking”. It is made with various kinds of fresh herbs like cilantro, mint along with coconut, unripe mango, tamarind, peanuts, dates, tomatoes etc. It is used as an accompaniment with an entree, as topping on breads etc. There are various kinds of chutneys – sweet, sour, sweet and sour, spicy, sweet and spicy. Depending on what you are planning to eat it with, you can make various kinds of chutneys. 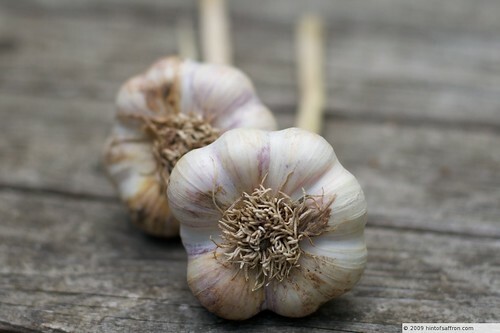 I would think garlic chutney would go well with Pizza, especially cheese pizza. You can also top it on any toasted crusty bread. The way we eat chutneys in India is usually on a thali – steel plate with various containers in it. The containers contain various vegetarian dishes served with chutney, Indian pickles (very different from the pickles in the west), chappati, rice, yogurt and papad (or pappadum). You take a piece of the chappati, scoop one of the entree and eat. At the same time, with the flick of a finger, you take the chutney or pickle and lick it! 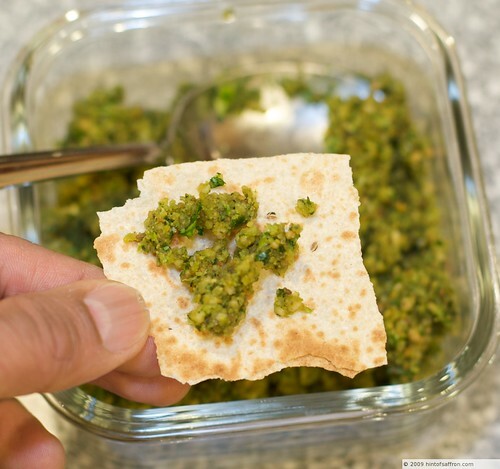 The combined taste of the entree and the chutney or pickle is heavenly. Try the garlic chutney with the spiced lentil with spinach and dill dish. Yum! The last time after frying the chana dal, I had forgotten to grind it separately. This time I made sure I fried the chana dal, let it cool and then grind it in a coffee grinder (I maintain a separate grinder for spices). When you fry the chana dal, make sure it does not get burnt. It should look as shown in the picture below. 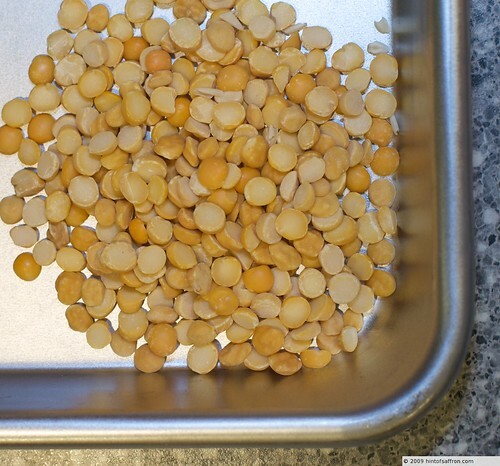 Then the chana dal can be added to the food processor along with the peanuts. 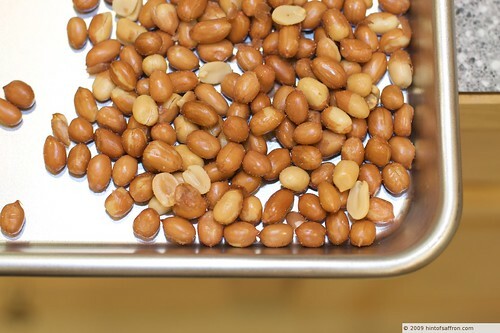 If you do not like peanuts, use organic shredded coconut. 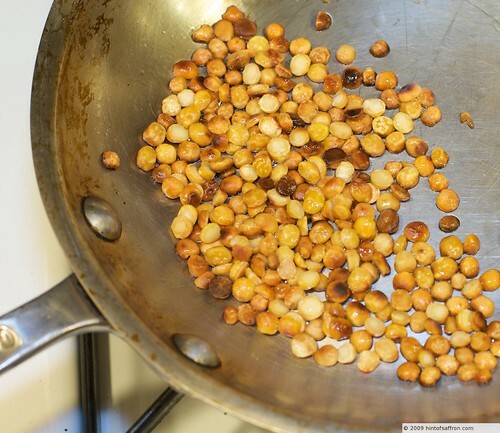 Fry the chana dal in 1/2 teaspoon of oil until it is lightly browned. Let it cool on a plate. Grind it in a coffee or spice grinder to a fine powder. 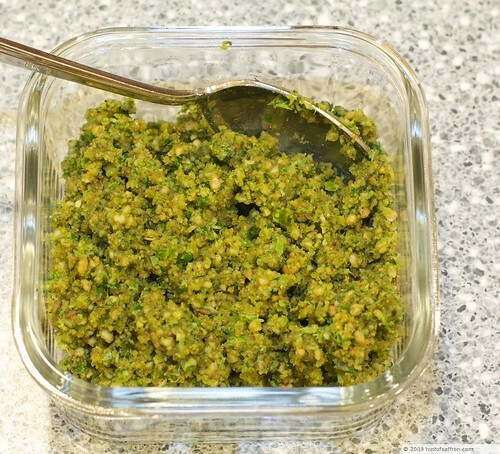 In a food processor, process the serrano chili, cilantro, salt and cumin seeds. Then add peanuts and the ground chana dal and process it till the contents are mixed. You can stop at the above step or continue to the next optional step. Either way, it tastes really good. Take a teaspoon of oil and heat it on medium heat. Add mustard seeds and asafoetida. Make sure to have a lid handy. Once the popping subsides, add it to the chutney above and mix well. As soon as you add the oil, the chutney will sizzle.